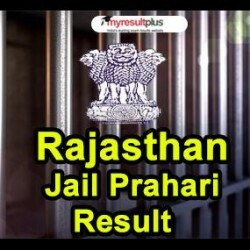 Rajasthan Jail Department Results and Cutoff for Jail Prahari Examination 2018 have been declared by the Sardar Patel University of Police, Security and Criminal Justice. The results are available on the official website of the Sardar Patel University of Police, Security and Criminal Justice. First of all, the candidates will have to go to the official website of the Sardar Patel University of Police, Security and Criminal Justice - jailprahariraj2018.in. 1. Candidates who have appeared in the Rajasthan Prison Sentinel Recruitment Examination 2018, they can examine their revised results for different areas from the link given below. 2. Candidates will get an official notification on homepage and link for Rajasthan Prison Sentinel Recruitment Examination 2018. 3. Candidates will have to click the link available on the homepage and it will redirect to a new page where you have to give some information.